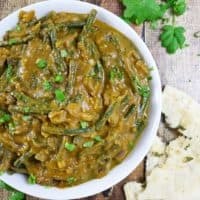 This Bean Pumpkin Curry is so easy to make and with pumpkin puree in the curry base, it is so hearty and filling with naan or paratha – and it’s ready in less than 20 minutes! As the time draws closer to when my daughter will be leaving for college, I find that it’s not just me that’s having a hard time letting go. Like Manny in the last episode of Modern Family, my daughter is starting to feel the pull of home more. And, I guess I should take some sort of comfort from that, but my heart aches just a tad more because of it. So much sap this morning – eh?! But, bear with me, as this weekend, this sentimental sap and her sentimental daughter indulged in a game that began way, way back in the day which lead to this hearty and easy Pumpkin Bean Curry that you see here today! When my daughter was a toddler, I started playing this game with her where she would pick up a new fruit or veggie once a week. We would eat it raw or cook it as need be. The fact that she picked it made her more apt to eat and enjoy it than if I had. And, sometimes, she ended up picking something I hadn’t ever had or cooked before – those were fun times indeed. At first, I figured I would just stir fry them. Stir frying is my easy way out when I have something new to cook. But, my daughter suggested I make a curry instead as we also brought home some naan and paratha that she wanted to try with a curry. As I had some pumpkin puree hanging out in my pantry, I figured I would use it as a curry base instead of tomato paste like I normally do. And, we were truly delighted with the outcome. 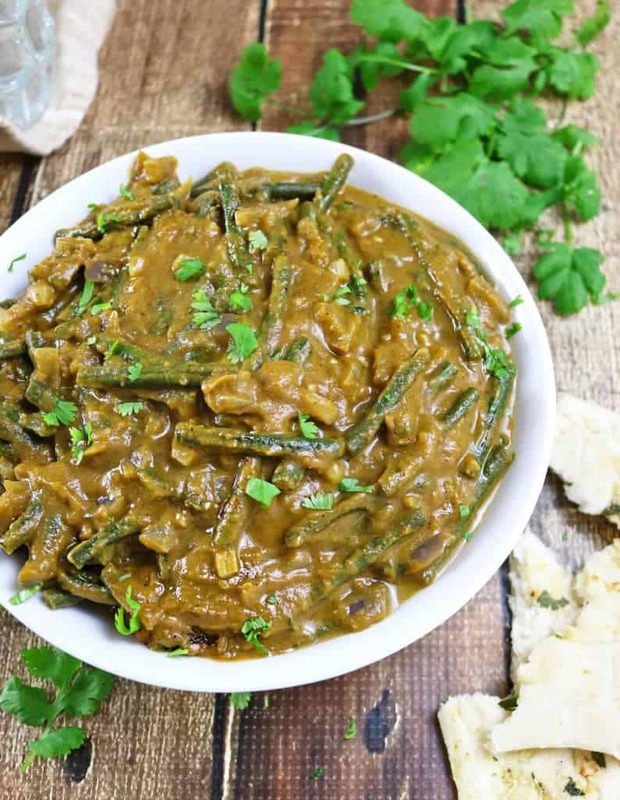 That pumpkin puree mixed up with some coconut milk, vegetable stock, garam masala and cumin was such a wonderful base for these extra long beans. And, this curry came together in less than 20 minutes! We sopped up the beans and pumpkin gravy with some naan and paratha and were quite happy with how hearty this simple, vegetarian Bean Pumpkin Curry was. 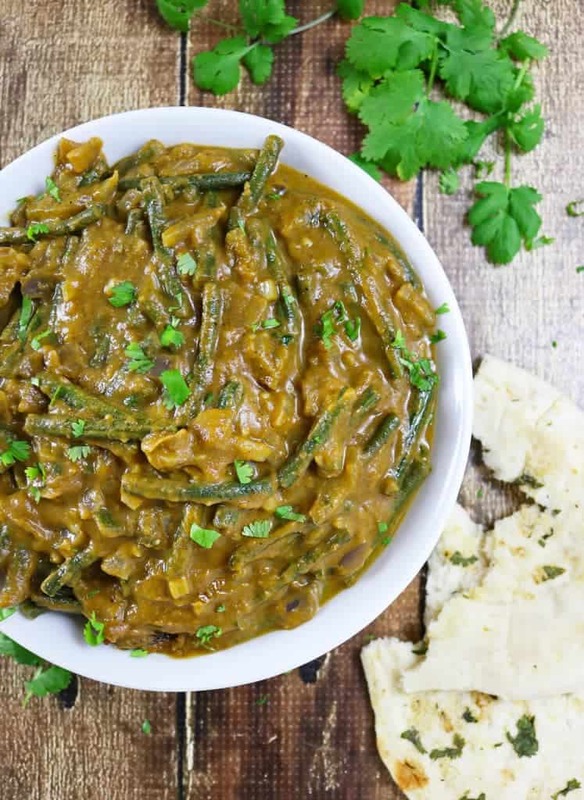 Here’s hoping y’all give this Simple and Easy Bean Pumpkin Curry a try and here’s hoping y’alls first day of Spring is simply lovely! Add olive oil to a pan (on a medium flame) and then add in the chopped onion and let cook, stirring a bit for about 5 minutes. Add in the garlic, ginger, coconut milk, pumpkin puree, vegetable stock, green beans, garam masala, coriander, salt and pepper and stir till well incorporated. Then, let simmer uncovered, for about 10-12 minutes - till sauce has thickened. Serve warm with naan, paratha or rice. This dish looks so flavorful and won’t bog me down, at the same time! Perfect for the first day of spring! That’s an interesting vegetarian curry. I don’t cook with beans as much as I should, so I’ll look for them in the shop this week. OMG Shashi! This is so awesome! I’ve never tried to use pumpkin puree instead of tomato… love the nutrient boost. I grew up eating these long beans (we call them karamani in Tamil), but the only way I make them is to just do a quick tempering with mustard, cumin, cook them in the tempered oil and finish off with a sprinkle of grated coconut. This way sounds way cooler! Next time I’m at Cherians, I’ll be making your version instead! A new name! When did that happen?! Congrats. I like it! That looks super duper delicious with pumpkin coconut curry gravy! My mom used to make a rice dish with those string beans and oysters. Yum yum! I just love how close you are your daughter are Shashi! Always makes me smile! And this curry is also making me smile – it sounds fantastic!! Sashi, your little girl is going to college, that is so crazy. You have all the right to be a sap,…be as emotional as can be. The best part, your lovely girl feels the same way too. I love the relationship you both share, it is precious. I am sure she will be very happy in college and you will go to meet her often. As to this curry, you know I love curry with chapathi and this combo is perfect girl. This looks super tasty. I love the pumpkin, but I have never tried it in a curry before! Shashi, you can be a sap with me anytime. <3 I get sad and sappy just reading about your daughter leaving… 🙁 It reminds me of the crazy mix of sadness/change/excitement/hope that I felt when I left for college. Love the game that you two used to play–what a fantastic way to make fruits and veggies more enjoyable. 🙂 This curry looks and sounds so delish! hand me a big bowl, please! Hope you have an amazing weekend. Hugs!